Hello from Boston, Massachusetts! I’m with Quizmaster Joe and Scorekeeper Declan at Boston Comic-Con, and although Anthony Daniels and Alan Tudyk are here, there’s no Star Wars news to report from here. 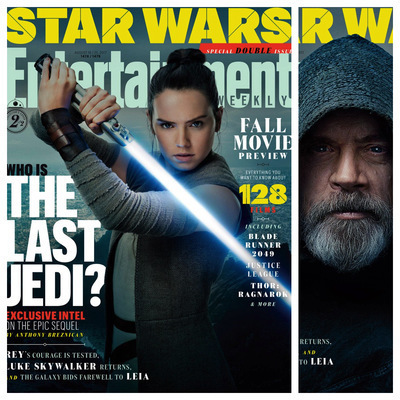 Thankfully, Entertainment Weekly published the last of its eight stories related to The Last Jedi, as part of the cover story for the 2017 Fall Movie Preview. 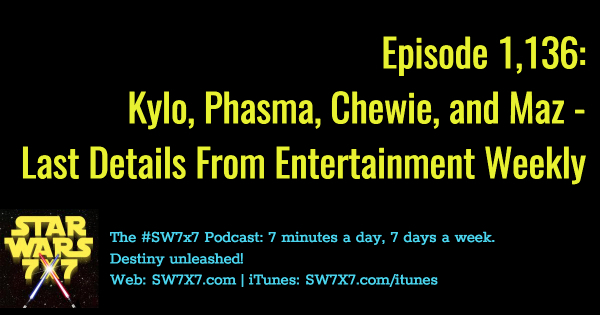 In today’s podcast, I’m reviewing (and theorizing) about the five characters discussed in the EW story: Kylo Ren, Captain Phasma, Chewbacca, Maz Kanata, and the (figurative) ghost of Han Solo. Previous Post: Episode 1,135: Will We Discover the Origins of Rey and Finn in The Last Jedi?